Reaching out to others is part of our mission at Trinity Church. The congregation helps to meet the community’s nutritional needs, makes diapers available to needy families, takes part in a network that shelters homeless families, and provides support groups with a place to meet. The Episcopal Church recognized these efforts by designating Trinity as a Jubilee Ministry Center in January 2015. There are more than 600 centers across the U.S. that empower the poor and oppressed in their local communities by providing direct services and advocating for human rights. Trinity Soup Kitchen was established in November 1995 as a service to those in need of a nutritious, hot meal. With the help of congregants and community volunteers, the Soup Kitchen serves meals each Friday from 10:30 a.m. until noon, except in August. Workers prepare and serve the meals on a rotating schedule. Donations from congregants, community members and local organizations cover the cost of the Soup Kitchen. If you wish to help, leave a check in the collection plate at services or mail it to the church office. Additional volunteers are always welcome. ​The Trinity Food Pantry began as a seasonal outreach, providing holiday meals to the hungry at Thanksgiving and Christmas, and was expanded in order to serve the community weekly. Food is distributed on the first Saturday of each month and on Thursdays the rest of the month, starting at 10 a.m.
Members of the church and groups throughout the local community provide donations. The Food Pantry can always use staple items for distribution to those in need and welcomes all contributions. 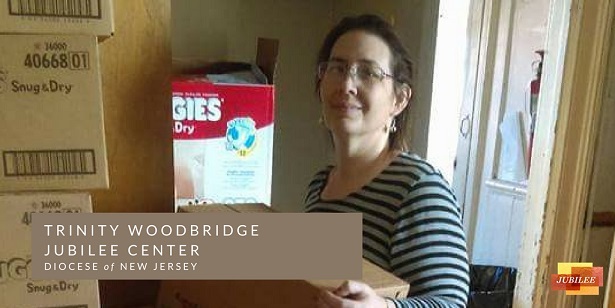 Our newest outreach ministry is the Trinity Diaper Bank, established in partnership with the Community FoodBank of New Jersey. The diaper bank is designed to help families with young children meet their basic needs. Diapers are distributed as available to registered families once a month. Families can contact the church office and leave a message to sign up. We will reach out for intake information and call eligible families with a distribution date. In most cases, families will have to pick up the diapers in person. Trinity is a host congregation for the Interfaith Hospitality Network, operated by Family Promise, a nationwide organization that assists homeless and low-income families. The parish offers housing a week at a time on a rotating basis. Volunteers from the congregation and the local community prepare dinners for residents and stay at the Parish House overnight. Our participation is coordinated through the FISH Hospitality Program, a Family Promise affiliate that serves Middlesex, Union and Somerset counties. ​Trinity Church hosts several support groups. Alcoholics Anonymous sessions, ranging from Open Meetings to “Big Book” Meetings, are held at various times throughout the week. A Nurse’s Support Group meets on Wednesday nights. For details on times and locations of meetings, check the calendar or contact the church office.